On a recent trip to Yosemite, I was referred to as a “historian” and I kind of liked it. I never really thought of myself as a Historian, and I felt gratified to be thought as such. Strictly speaking, I could be thought as one. According to Dictionary.com, one of the definitions of a Historian is “a writer of history; chronicler.” Well, maybe. But on closer reflection, I just can’t make that claim. Even on Dictionary.com, the primary definition is “an expert in history; authority on history.” I’m neither of those. I supposed you could say I am somewhat familiar with Yosemite and its past. Certainly not “history” in general. Being “Familiar” with a subject is a far cry from being “Expert” on it. 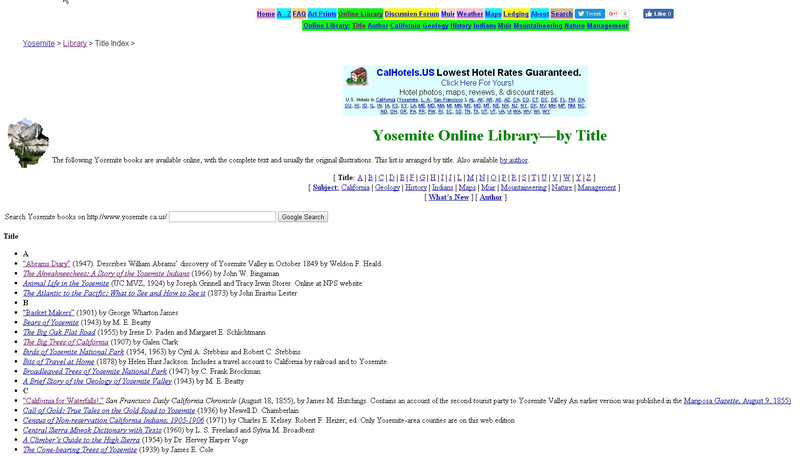 And every time I think I have some aspect of Yosemite’s history down cold, I run into something new. So much for being an “authority”. A historian, like I do, garners information from a variety of sources, but a “real” historian relies on what is called “primary” source material. All of my information comes from secondary, tertiary and higher level sources. Let me explain. If I read Shirley Sargent’s biographical account of John Muir (John Muir in Yosemite), I get her “take” on John Muir which she put together from her various source materials. That is a secondary source because I am relying one her interpretation of her sources. It’s like in a trial, “hear-say” is not allowed because it isn’t “best evidence.” Even if I read John Muir’s books, which by most all accounts should be a primary source, I am not reading his manuscript or the notes he took to put the manuscript together. Many of his books were written well into his life, when the events he describes are taken from the notes he made many years earlier. Those notes are the “primary” source materials I mean; none of which I was able to consult. So what does that mean? What kind of sources do I use? Does it mean my stuff isn’t worth reading? I wouldn’t go so far as to say it’s not worth reading. But it depends on what you’re looking to find out. If you are looking for primary source material, it’s not me…at least, not so far. But you can use it as a chronology and even a bibliography to other writings that are closer to primary source material. Nevertheless, as far as I know, I’ve told you what I have found and believe it to be accurate and truthful, as far as it goes. Much of the information is pretty clear and comes from a variety of differing sources. But some of it, most notably the history surrounding James D. Savage is pretty much based on a single source, that of Lafayette Bunnell. His book Discovery of the Yosemite… finally published in 1892 was 41 years after the fact. It borrowed a significant amount from an article he wrote for and was published by James Mason Hutchings in May 1851 (in Hutchings’ California Magazine). Almost all other information comes from sources that reference one of these accounts. We know this article was edited by Hutchings, but we don’t know to what degree. For instance, Bunnell wrote later that the name of the valley was made as “Yosemite” but it was Hutchings that felt the better representation of the name was “Yo-Semity”, so that is what he wrote as Bunnell’s words. One of these days I’ll look more closely at that and what the name discrepancy was all about. But, pardon me, as I have wandered into the weeds. My point is that what I write is factual, as far as I know, if I am suspicious of anything, I say so. Additionally, I have taken pains to document my source material for anyone that wants to do their own research or just some fact checking. And if my “sourceing” is unclear on a particular point, you are more than welcome to contact me through the web-site and I’ll do my best to be more specific. There are three basic repositories I use for source material; On-line sources, predominately, at Yosemite.ca.us; my own library of books and materials; and my own collection of compiled data from various aspects of the first two. A good majority of my information comes from what I have found on the internet. I do use Wikipedia, but try not to rely on it, because I have seen evidence that some information they provide is just flat wrong. Consequently, if I cite Wikipedia, there are usually other sources that have said the same thing. Unfortunately, a lot of information about Yosemite is so obscure, that there may only be one source, so it gets kind of sketchy. I have not been successful using the library for source material. I only have access to the local, small town libraries that just aren’t that robust. So I have been trying to put together my own library. The feature image on this post shows what I have, so far, collected. This is my second most commonly used source repository. I haven’t read all of these volumes, but I have read a few, and I have read a little from almost all of them. Of course, not all of what I write is historical in nature. I write about hikes, my own experiences and photography. These latter kinds of things do not require well documented primary source material. Historically speaking, to date, most of my reading has been on-line due to the good graces of Daniel E. Anderson’s fabulous site, Yosemite.ca.us. Primarily, it is an online library of digitized material, but also has current information (or, at least, near current. The last update was May 2016 as of this writing) such as a forums, lodging, FAQs and even some online exhibits. But the on-line library is the most valuable to me. The books he has available are listed by subject, title, author and any of a variety of categories. I have probably spent the last 12 to 15 months going through the various books and articles he has available on line. Though I’m using other material now, I will still go back to it from time to time to pick up on some other things. Finally, to some extent, I rely on data that I have put together from a variety of sources for myself. They consist, primarily, of lists that are mostly incomplete. They are works in progress. They include a chronological list of buildings put up in and around the valley, a list of the annual visitor count since 1851, and a time line of events significant in Yosemite history. The visitor count list, for instance, has data missing from 1856 to 1863 (though the average increase in attendance per year was about 76.25), 1887 to 1905 is also missing (1886 was estimated at 3000 by the Board of Commissioners in 1887 and the average increase during those missing years was 135 per year). I try to keep this up the best I can at the beginning of each year by checking with the Stats at the National Parks web sites. The other lists are a more casual work in progress.